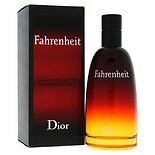 Shop Christian Dior Fahrenheit Men's Eau De Toilette Spray (3.4 oz. )3.4 oz. When you want a new fragrance that you can wear every day, consider the many Christian Dior colognes. Christian Dior offers scents designed for men and women, so you are sure to find the right scent for yourself or a loved one. With so many scents, fragrance profiles and types of colognes on the market, choosing the right one for you can be difficult. If you are considering a new scent from the Christian Dior colognes line, decide what type of body fragrance you want to help you narrow the choices. Whether you want something fruity, floral or musky, Christian Dior colognes are sure to have the perfect body fragrance for you. Some of the available cologne choices also include undertones of citrus, sandalwood and other natural scents. Test each product on your body. Your body chemistry causes subtle changes in colognes and fragrances, altering the overall scent. The different names assigned to various fragrances have different meanings. When you understand the difference between each type of fragrance, you can effectively choose the right one for you. Each product name refers to the concentration of natural scent oils. The higher the oil concentration, the more powerful the scent is and the longer it will last. Perfume has the highest concentration, followed by eau de toilette and eau de parfum. You can find the perfect product among the available varieties of Christian Dior colognes.